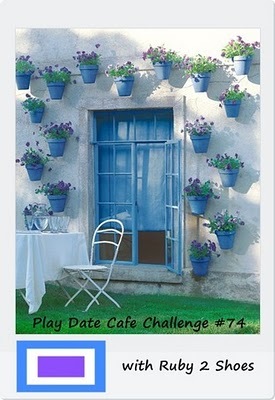 I still had this DP on my desk from yesterday's card when I checked the Color Challenge on SCS - I jumped with joy! Julia chose Marina Mist, Baja Breeze & Certainly Celery - perfect to use this same DP! The optional dessert was to use a bird on our card. 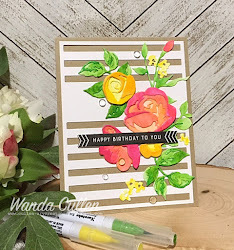 The Teapot Tuesday Challenge is to create a girly girl, feminine card with ribbon...we can't get in the door to the party unless we bring ribbon! All girls like some bling and flowers, so had to add those embellishments! The destination is a fellow stamper, Ashley Finical from Mt. Vernon, IN, that lost her stamping supplies when her house was recently flooded. 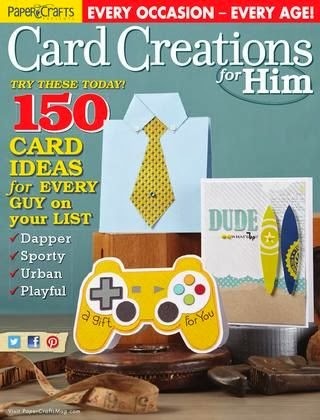 Not only will I send her this card, but I intend to send a box of supplies as well! Can you imagine her postal carrier when these packages start arriving - lol! I used Karen Giron's great sketch for the layout. I love this sentiment by Emily Dickinson and wanted to use it as the focal point. What else did I use? 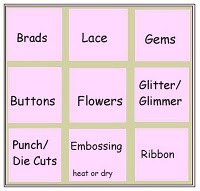 ACCESSORIES: Adhesive rhinestones (Michael's), Mini rolled roses dies, 2-step bird punch (SU), Sheer ribbon. 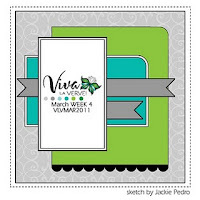 It's Mojo Monday and Teresa has a super circle or square sketch for this week's challenge! I tweaked it a bit so I wouldn't cover up all this gorgeous DP. 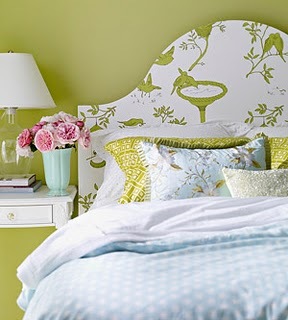 This is also for the Shabby Tea Room Challenge - to use a flower palette based on this inspiration picture. 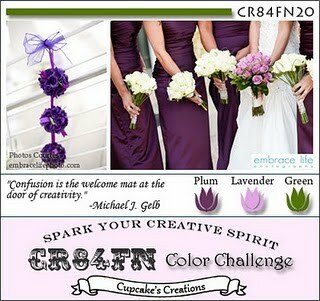 ACCESSORIES: Large Scallop Circle & Large Circle Nesties, Twine, Lace trim, Mini rolled roses dies by MFT, MS frond punch. 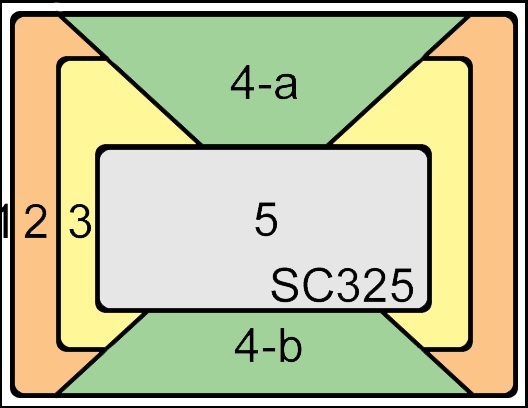 I created the frame by using Labels Sixteen & small ovals Nesties. The flowers were colored with Copics and cut out. Some adhesive pearls were added to embellish. 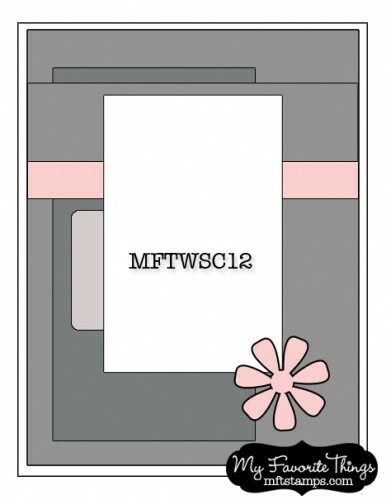 Our Creative Corner's challenge this week is to make an ATC (2.5 x 3.5 size) using kraft, white or cream, black or chocolate plus one other color. 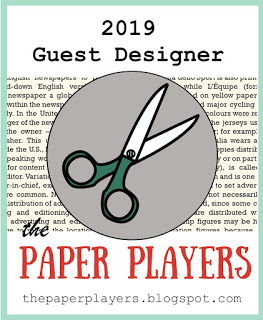 I made mine in a tag format, starting with some Flora & Fauna Ledger paper from K&Co. I don't have kraft ink (note to self: order at next SU club meeting), so subbed Creamy Caramel to stamp the flourish BG. The edges were distressed using a tool then sponged with Memento Rich Cocoa. The bliss sentiment was also stamped in cocoa ink. The punched butterfly was sprayed with Dazzling Diamonds Glimmer Mist by Tattered Angels and chocolate pearls added to the body. Hey blog friends...just a friendly reminder to get those brain waves rocking and join us in the For Your Inspiration challenge! Stef has a beautiful sunset photo and if you are ready to use up some shades of lavender or purple...this is your chance! 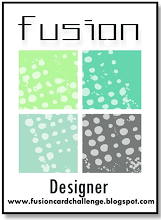 Stef gave us another fabulous web site (Ruche) to browse for inspiration for the IC and I loved all the unique fashions and accessories! I chose this adorable coral red dress for my inspiration in dressing up this PI image. 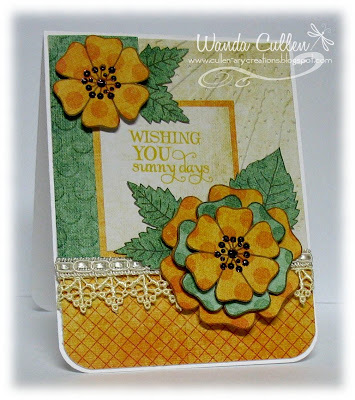 The ruffles inspired my use of the doily lace border punch. 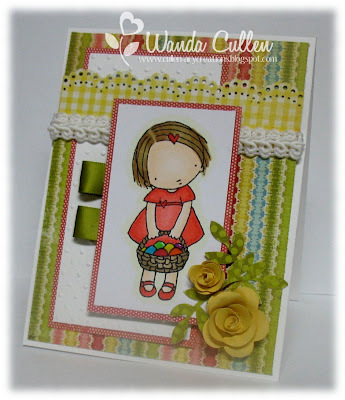 The layout is based on the MFT Wednesday Sketch Challenge in the MFT forum and because this is a spring themed card, it qualifies for the Totally Gorjuss Challenge. I add Crystal Effects to the eggs and colored with Copics, Can't stop making these rolled roses now that I have a tool to make it so easy to roll the die cut paper! Have to get busy and run some errands...it's so cold again and even calling for snow tonight! Brrrr. The Free 4 All Challenge on SCS calls us to use a "Hello Sunshine" theme, so I chose sunny yellow/orange hues, Tim Holtz' "Rays" EF, and a sunny sentiment. 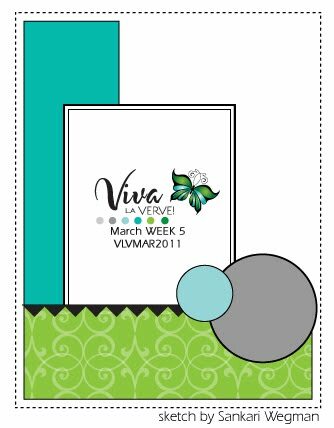 The elements were arranged using Sankari's fabulous Viva la Verve sketch challenge on the Verve forum. I also used 3 patterned papers so this qualifies for the Paper Cutz Challenge. 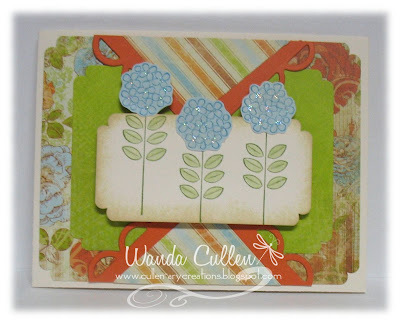 I love to layer this Verve flower and added Cinnamon Stickles to the centers. Thanks for stopping by and commenting! STAMPS: Great Friend (Verve) - flower; Let it Shine (Verve) - sentiment; Delightful Dahlia (PTI) - leaves. I'm excited to be a bar tender for Joni's Raise the Bar Challenge! This week we are to create a card inspired by a foreign country. Paris is still on my bucket list and in the meantime, I can only dream of the Eiffel tower, romance and flowers adorning an outdoor cafe! 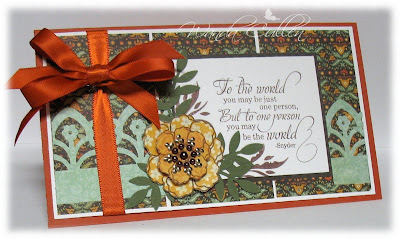 The image was stamped on Vintage Cream CS, distressed then sponged with So Saffron ink. Below it is a doily die peeking through in Regal Rose. I finally was able to make satisfactory rolled roses using MFT's dies and a tool to make rolling SO much easier! On one end, it has a metal tip with a slit to "grab" the end of the paper and on the other end it has a rounded ball so you can "curve" the petals if you like. I didn't use this end on my roses, but think it would work for the larger rolled flower dies. 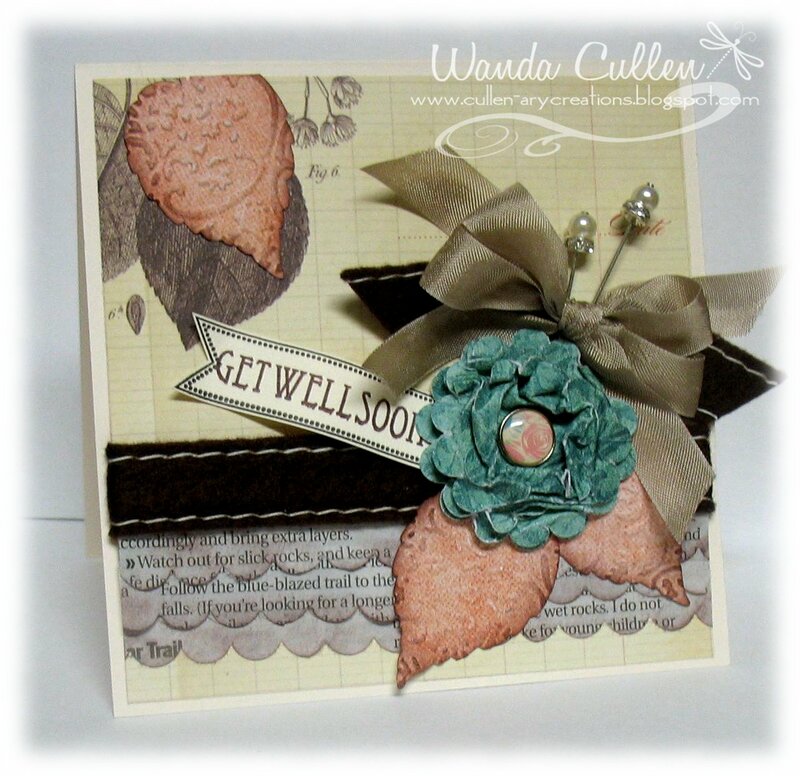 A seam binding bow and some bling top off this shabby chic card. 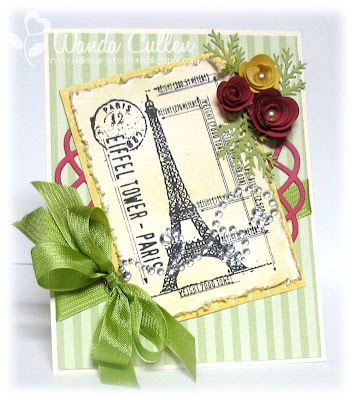 This card is also for Betty's Color Challenge on SCS: Regal Rose, So Saffron, Pear Pizzazz; dessert option is to use things that start with "P" - Parisian image, pearls. 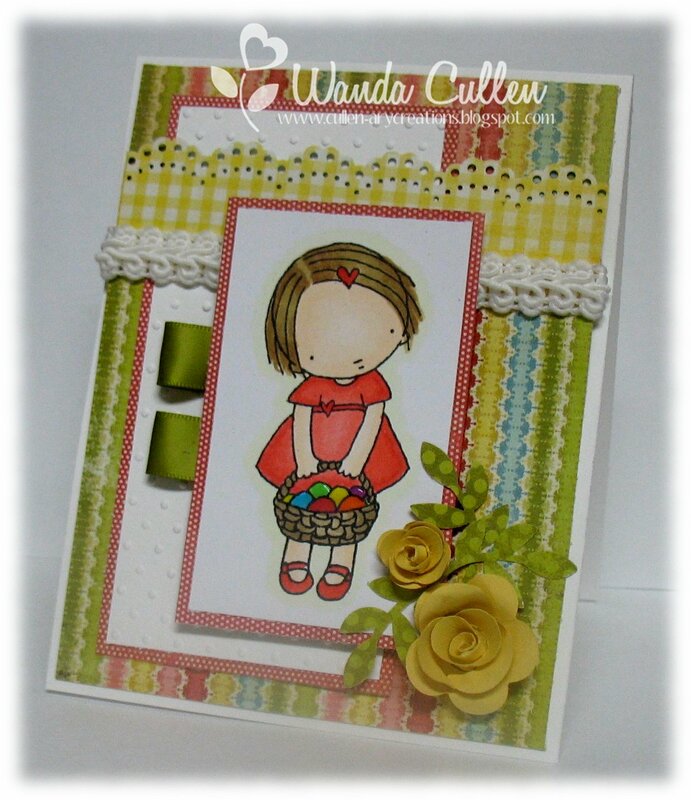 It's a dismal, cold and blustery March day, so will have to warm things up with a spring creation in my stamp room! Just got this tulip corner stamp in the mail yesterday, so it was perfect for the Stamping in Time ODBD challenge to use something new. I used the purple/blue/white colors for the Play Date Cafe color challenge...coloring the image with Copics and layering with Plum Pudding (PTI), Marina Mist (SU) and white. The sentiment was stamped over the triple layered mat stack dies from MFT. This card is also for Paper Sundaes Challenge to use embossing. I used two EFs from SU: Square Lattice and Framed Tulips. 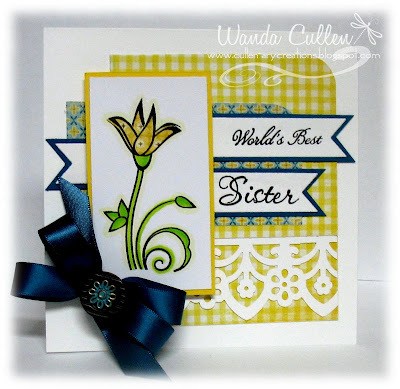 STAMPS: Tulip Corner (ODBD), I Am the Way (ODBD) - sentiment. STAMPS: He is Risen! (ODBD), Delightful Dahlia (PTI) - leaves. 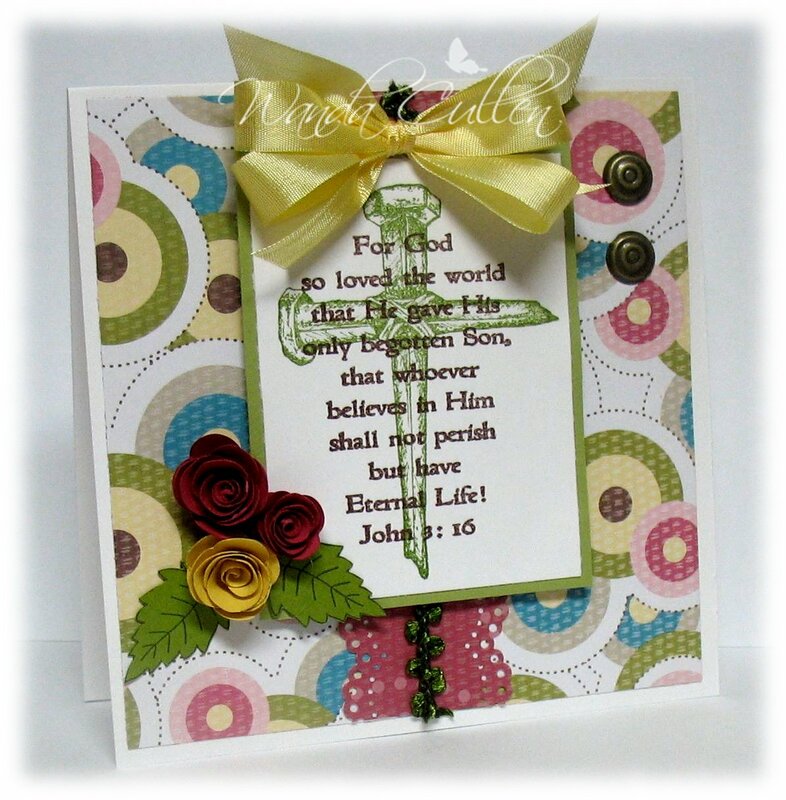 PAPER: Sweet Pea DP (SU), Pear Pizzazz, Regal Rose, So Saffron, Old Olive (leaves), Neenah Solar white. 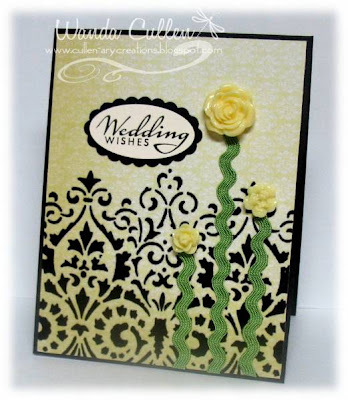 ACCESSORIES: Metal brads, MS seam binding, Mini rolled roses Die-Namic (MFT), Doily lace border punch (MS), Green embroidery trim. Don't forget to check out Sarah Bigelow's Blogoversary celebration if you want to win some free Verve! 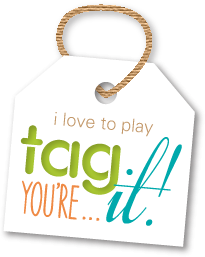 Also, we'd love to have you play in the photo inspiration challenge on the FYI blog...CHECK OUT THE DETAILS HERE. Somehow, I loaded this to my SCS gallery and forgot to add it to my blog...so here's my CAS card for Stef's Inspiration Challenge - to be inspired by something from the Kirkland's website. There is a large Kirkland's in Charlottesville, about 30 miles away and it's always a fave place of mine to stop and see if there's something I can't live without. 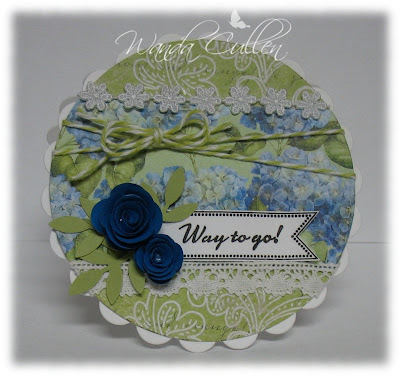 I was inspired by this floral arrangement...some rickrack and resin flowers were added to the already flocked DP, a quick punched sentiment and this was a done deal. 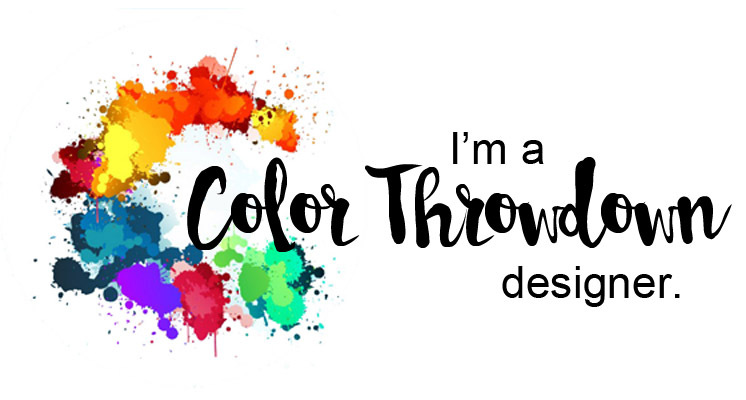 Our Creative Corner Challenge - Don't throw that away! I used newspaper comic strip packing to create the flower. 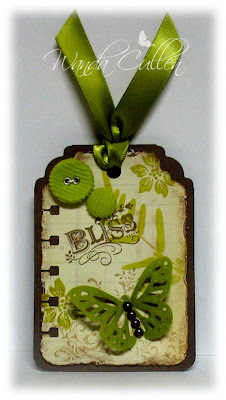 Stamptacular Sunday - Use sentiment as main focal point. When I saw the CR84FN challenge colors, I knew I wanted to use these lovely Webster's Pages papers. Julee's Mojo Monday Sketch Challenge worked great for the layout, plus this works for Kraftin' Kimmie's Challenge to use big buttons, and for the Totally Gorjuss Challenge to button it. 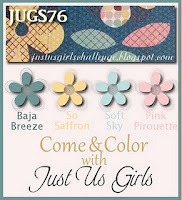 For information about Sarah Bigelow's Blogaversary Give-away, click HERE. 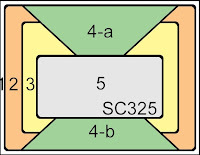 SCS Technique Lovers' Challenge - use newspaper on our card. 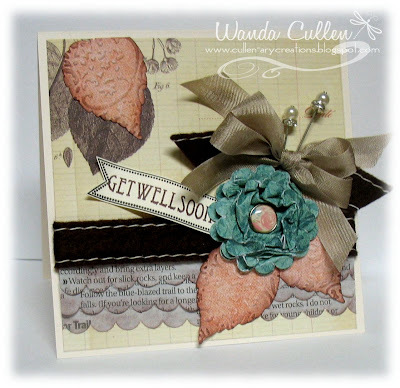 Crazy 4 Challenges - Silke has a color challenge using pink, kraft, turquoise & brown. I punched scallop edges on 3 strips of newspaper and sponged the edges with chocolate chip ink. The leaves were die cut from DP by My Mind's Eye Home Pack (Photo Mat Pink) and the flower was punched using the circle scallop punch 5 times on paper from the same pack. I scrunched up each layer and fastened them together with a BasicGrey brad. Some felt ribbon and crumb cake seam binding (SU) were tied together and accented with 2 Jenni Bowlin stick pins. 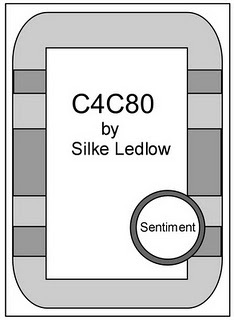 The sentiment flag is by Lil Inkers Designs. The leaves were run through an EF after they were die cut and then sponged with chocolate chip ink. The base DP is from K&Co's Flora & Fauna Ledger found at Mike's. My eyes are barely open, so will try to finish this post without screwing it up, then head for bed. Nite all! Hello friends! 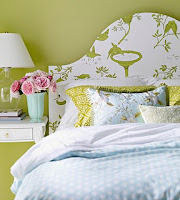 I have the great pleasure of helping Sarah (one of the fab Mojo Monday DT) celebrate her birthday and blog anniversary. 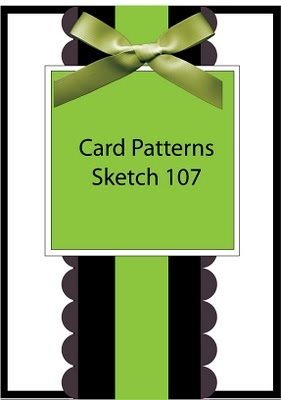 I sure hope you will join us by commenting on all the blogs and creating a card using her sketch. There are prizes to be won - Verve prizes ...woohoo... it doesn't get any better than that! 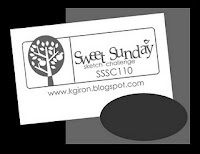 The blog line-up is listed below as well as the sketch. 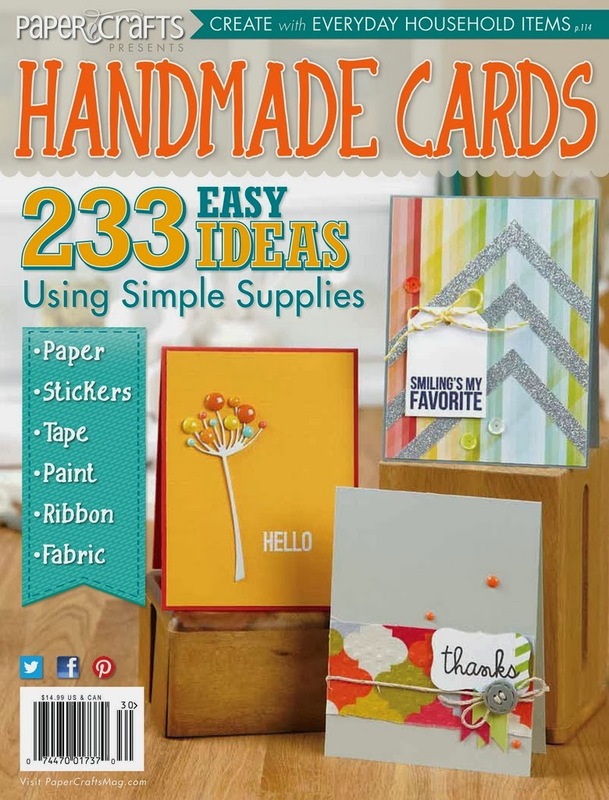 You will need to link your card to Sarah's blog by April 2. So, come and join us...for more details you can head over to Sarah's blog. 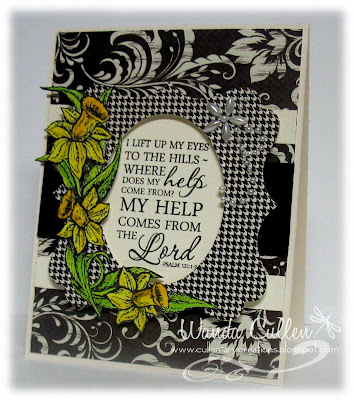 Here is my card for this sketch challenge...I can't seem to stop using these new My Mind's Eye papers, so I started with a DP from the Mabel pack and went from there. 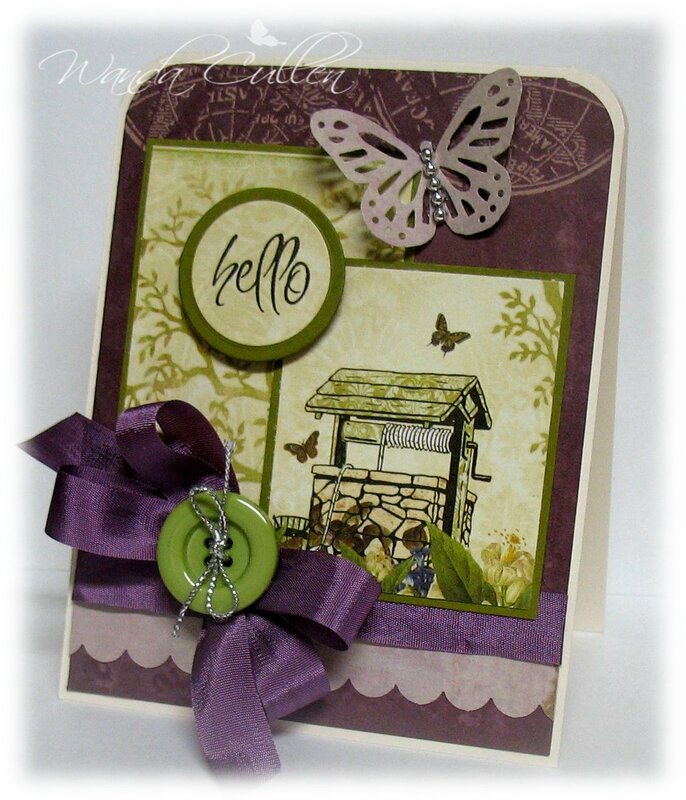 I punched a Garden Gate (one of Martha's new deep punches) border and used the sentiment as the focal point. The flower is layered and topped with adhesive pearls. 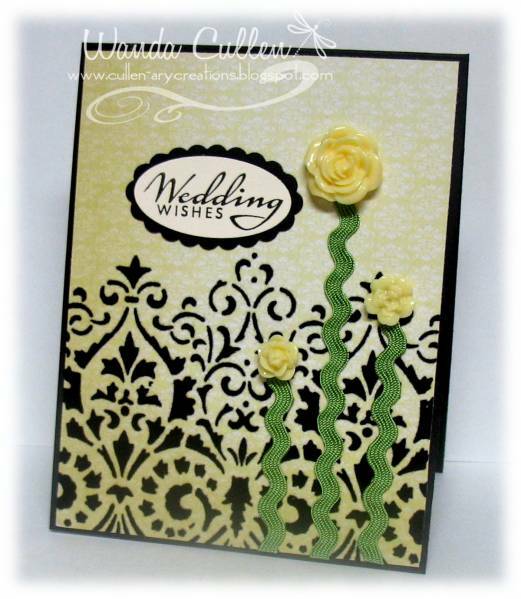 ACCESSORIES: Terracotta satin ribbon (PTI), Garden Gate punch (MS), Frond punch (MS) Adhesive pearls. Thanks for stopping and hopping! 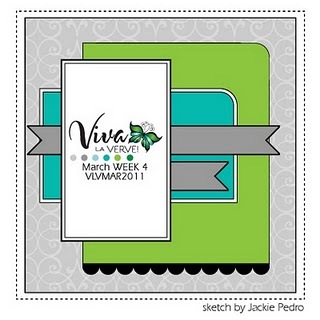 Jackie has a great sketch for the Viva la Verve Challenge on the Verve forum! I went with...yep...you guessed it...more MME papers...this time the Stella & Rose Gertie pad. 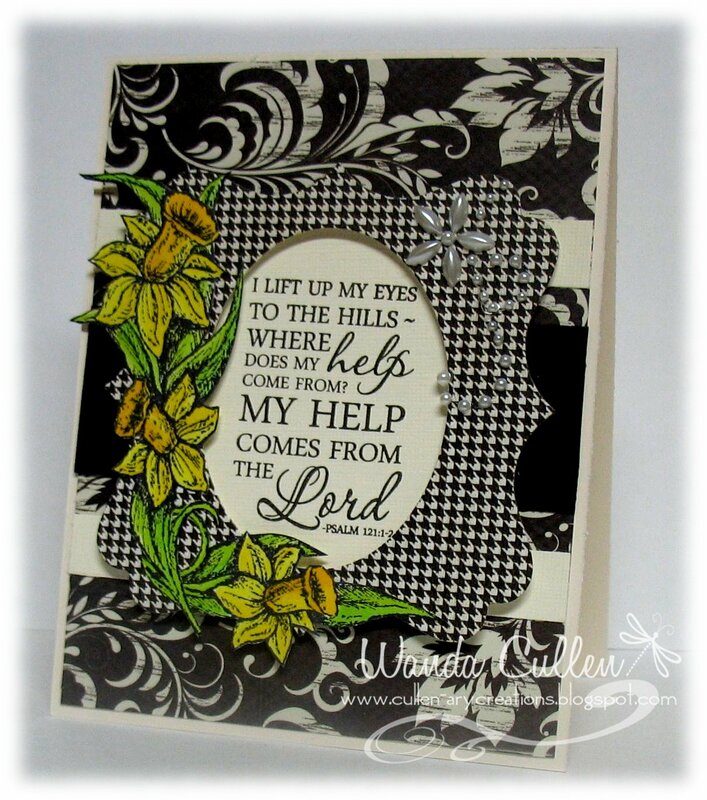 I love this yellow gingham print and sadly, I almost covered up the blue/yellow print. I used the Lil Inker's sentiment flag die and cut 3 flags from white CS then layered it and hand cut Enchanted Evening CS by PTI. 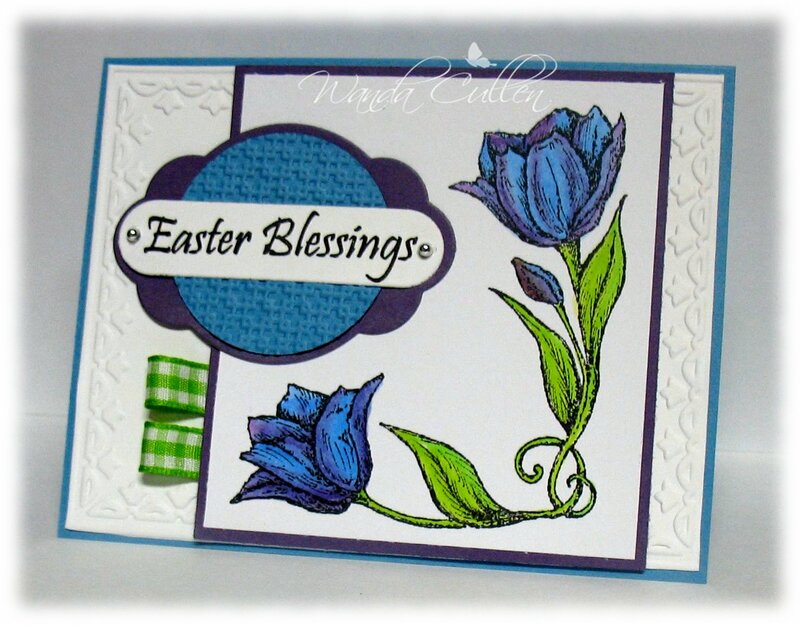 This card uses 3 different Verve sets: World's Best (1st half of sentiment), Because of You (2nd half of sentiment), Everlasting Life (flower). The flower was paper-pieced and the stem/leaves were colored with Copics. The border is a deep punch by Martha called Garden Gate. I started to stop at this point, but the Enchanted Evening satin ribbon was calling out, so I added a bow with a Tim Holtz button accent. Thanks for stopping by and leaving your comments! 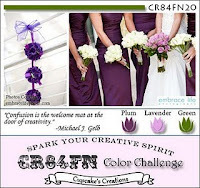 For Your Inspiration Challenge - IT"S NEW!